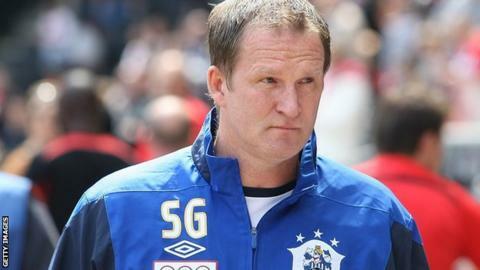 Huddersfield boss Simon Grayson is remaining realistic despite his side's excellent start to the season. The Terriers, who won promotion to the Championship via the play-offs in May, beat Blackpool 3-1 on Monday to move up to second in the table. "It's nice to be in that position but there's 39 games still to go," he told BBC Radio Leeds. "We're not going to get carried away with what we've done so far but I'm delighted with the result." Huddersfield had picked up just one point from their first two Championship games prior to signing James Vaughan on a season-long loan deal from Norwich. Since his arrival they have picked up 13 points from a possible 15. He added: "We'll still have some dark days over the next few weeks and months and you have to have one eye on what the division is all about because it's very tough." Goals from Lee Novak, James Vaughan and Oliver Norwood saw the Terriers inflict a first home defeat of the season on the Seasiders. Grayson praised the diligent nature of his side's performance at Bloomfield Road as they extended their unbeaten run to six. "The players are playing with no fear and they're working extremely hard for the shirt," he continued. "People like Danny Ward and James Vaughan are known for their work on the ball but it's their work off the ball that has helped us win." Meanwhile, on-loan striker Vaughan is relishing his start to life at the John Smith's Stadium. The 24-year-old, who is on a season-long loan from Norwich City, scored his second goal in five appearances to put the Terriers back in front before half-time on Monday. "It was brilliant to hear the fans chanting my name and I'll always do my best for them," he said. "I'm really enjoying my football at the moment and I'm looking forward to the season ahead."